Effective Inbox Management: Are You Using the Right Email Tools? How much time do you spend reading, sorting, and answering emails every day? How many times throughout the day do you have to stop whatever else you are doing to manage email in your work or personal inboxes? For most of us, bulk email is a fact of life. In jobs where constant communication with colleagues, clients, managers, and customers is necessary, email is in most cases certainly quicker and more efficient than jumping on a call or attending a meeting. However, just because email is convenient doesn’t mean it can’t impact your productivity. Having the right email tools to manage your inboxes, and keep track of your email can make all the difference in the world. And with email tools we don”t necessary mean the right email app., but rather the tools that are available to you within the email management of your choice. Suddenly, that long morning routine of getting your email down to “Inbox Zero” takes a fraction of the time. You have ways to avoid email-related distractions throughout the day—without missing important messages, of course. All of a sudden email becomes something that is there to boost your productivity rather than hinder it. Mailbird is built around a series of email tools that are designed to make your email management process faster, more efficient, and less distracting. 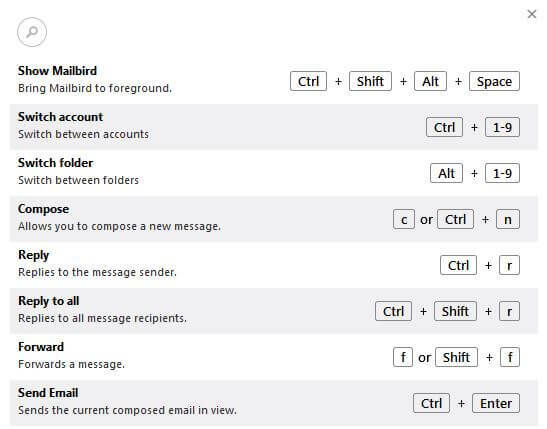 If you are already using Mailbird, here are a few tools you should be incorporating into your day-to-day routine. And if you don’t have Mailbird yet, these are the email tools that might inspire you to give it a try. Are you tired of hopping back and forth between your personal inbox and your work inbox? 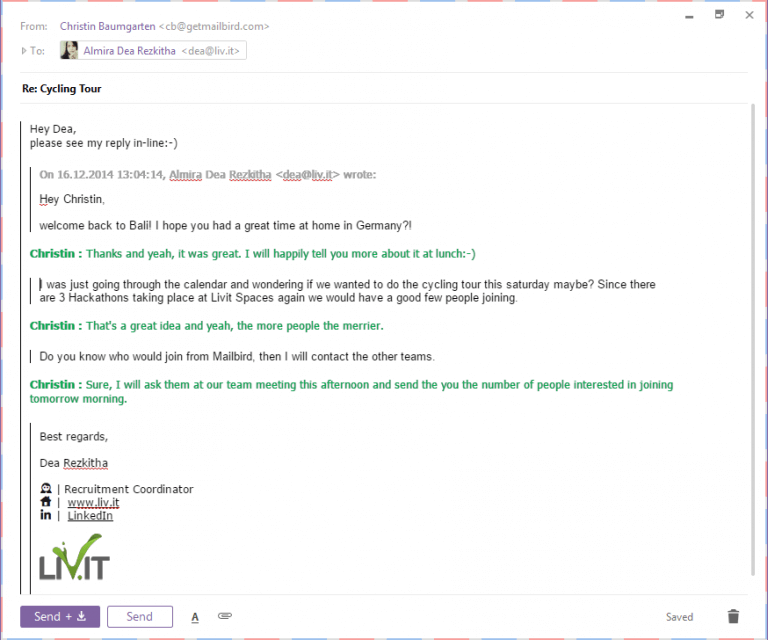 Mailbird’s Unified Inbox feature can make your life easier. Our Unified Inbox allows you to view all your email messages, from all your inboxes, aggregated into one convenient inbox. 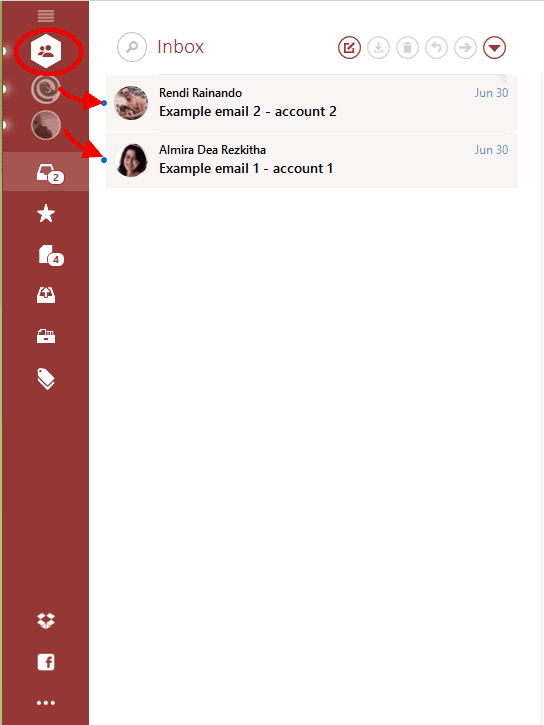 The feature pulls together all your emails, putting them in chronological order based on date and time received. If you are in a hurry and need to go through all your emails quickly, Unified Inbox makes the process faster—especially if you have three or four different inboxes that you need to manage. Unified Inbox is displayed as just another inbox in the left-hand column of Mailbird, which means that you can easily switch back and forth between your isolated inboxes (for work, school, home, etc.) and the unified view. 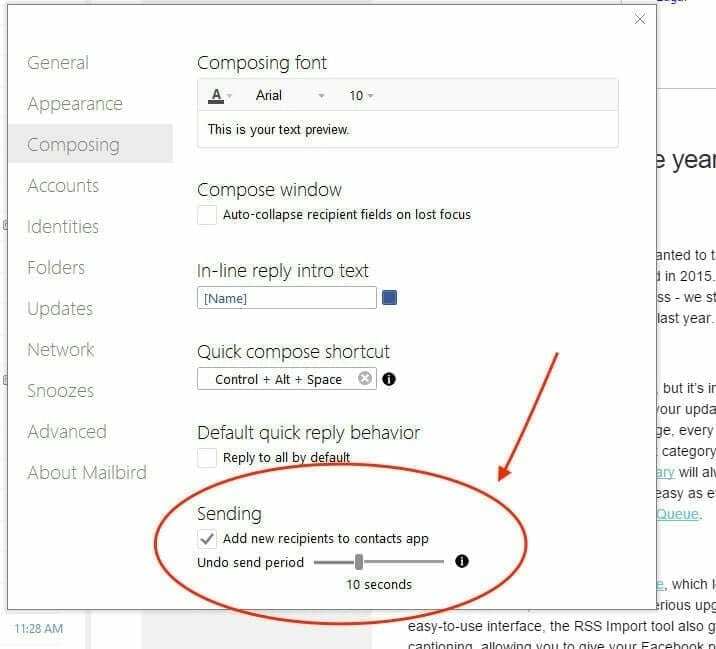 Inline Reply can be the most efficient way to draft an email response if you need to respond to different parts of an email message. For instance, if you receive an email that poses five different questions to you in bullet point form. You might use Inline Reply to type out your responses underneath each bulleted question. The problem is that replying inline can get confusing. Your responses can blend into and get lost in the original email. This issue is particularly problematic if you have an email chain going and multiple people are replying inline in their responses. With Mailbird’s twist on Inline Reply, it’s easy to color-code your inline responses and tag them with your name. You can use Mailbird to customize the color in which your inline responses will appear. You are in the middle of a project at work when you remember that you need to send THAT certain email to someone. Wouldn’t it be nice if you didn’t have to stop what you’re doing and open your email client or direct your browser to your preferred webmail site in order to draft an email? With Mailbird, you can use a Quick Compose keyboard combination to bring up a compose window and quickly type up an email. The process is quicker and allows you to get back to the project at hand much more swiftly. By default, the keyboard combination is ctrl + alt + space, but you customize the combination to be something else if you prefer. 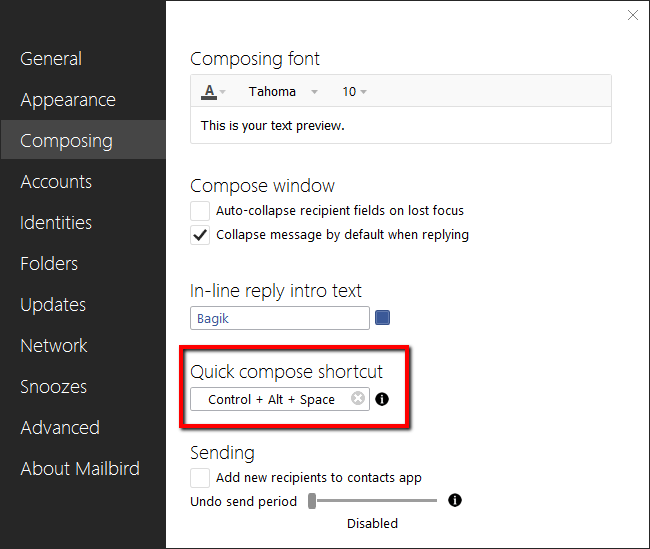 The “Quick Compose” feature isn’t the only keyboard shortcut that Mailbird has to offer. There are also keyboard shortcuts that you can use to quickly forward, archive, or reply to your email messages. Once you’ve mastered all the different shortcuts, you will be able to manage your email inboxes with new levels of speed and efficiency. You can find a list of all shortcuts (Mailbird and Gmail) in the Apps menu in the top left corner of the window. 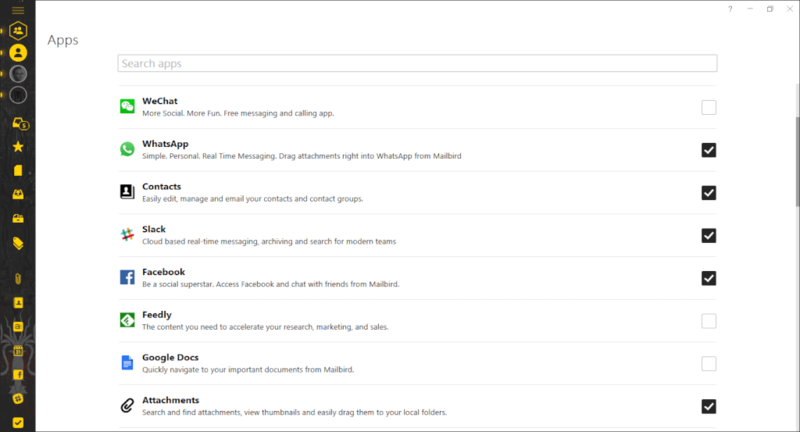 Mailbird doesn’t just integrate all your emails into one central email management hub (or, if you need, into one Unified Inbox); on the contrary, it can also connect to your various calendars, task management, and other productivity apps. Do you use Google Calendar to keep track of your day-to-day agenda? You can integrate it with Mailbird to monitor your tasks and keep an overview of upcoming events. Check out our latest post on how to best combine Google Calendar and email. 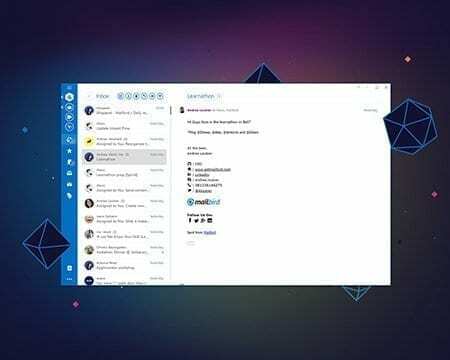 Manage your emails and all of your favorite apps in one beautiful hub. 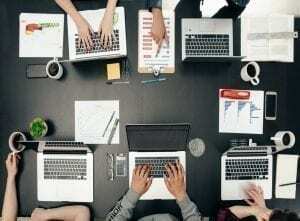 Do you use apps like Evernote and Asana to keep track of your projects and track the productivity of your teams? Mailbird can integrate with those and much more. These integration features drastically expand your arsenal of email tools. You can simply activate the apps of your choice in your Mailbird Appstore. How many of you have accidentally sent emails before they were finished? Or mistakenly typed the wrong names into the recipient bar? How many of us have sent emails only to notice grammar errors and misspellings a moment later? Usually, email mistakes are small and resolved with a quick follow-up email and apology. If you’d rather avoid the embarrassment, though, you can use Mailbird’s “undo send” feature. After you send a message in Mailbird, you will see a “Sending messages” dialogue box with an “Undo” link. If you realize that you made a mistake, you can click the “Undo” button to prevent the email from landing in the recipient’s inbox. When setting up undo send, you decide the time frame in which you get to “unsend” that embarrassing email. Perhaps you get a feeling of thrill and accomplishment by reaching Inbox Zero. Maybe you are someone who tends to get very distracted by email when you are working on projects for your job. In either case, our Snooze feature can help. One of Mailbird’s most unique email tools, Snooze, allows you to temporarily archive emails to a special “Snooze” folders. If you receive emails that you don’t want to deal with right now (but also don’t want to forget about), you can “Snooze” them like you would snooze an alarm clock. Set a time for Mailbird to remind you about the email (in an hour, later tonight, tomorrow morning, etc.). The email will disappear from your inbox for the time being. When the scheduled reminder time arrives, Mailbird will put the email in question back at the top of your inbox. Read our post to learn all about the Snooze feature, set up, and how to use it most effectively. Try Mailbird and get all your emails sorted with the best email tools available. Are you tired of struggling with email management tasks? If so, consider giving Mailbird a try. The email tools above are all designed to help users manage their email inboxes more seamlessly and efficiently than ever. 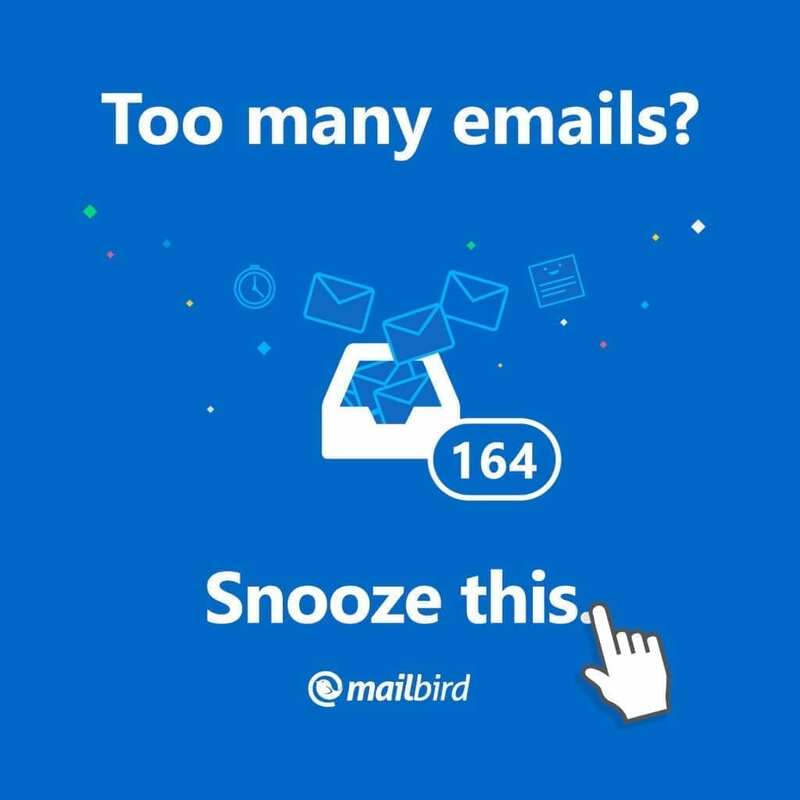 Email shouldn’t impair your productivity or stress you out, and with Mailbird, it need not do either anymore.  To learn more about the many useful email tools that Mailbird has to offer, click here. 6 thoughts on "Effective Inbox Management: Are You Using the Right Email Tools?" Using the Right Email Tools? Currently I am and it is not Mailbird! The missing “TOOL” is FILTERING. There seems to be a stead fast reluctance to add this “TOOL” to Mailbird. When Mailbird is enhanced to INCLUDE FILTERING, I am sure you will be well rewarded with new customers! Custom labels for emails – this absolutely MUST HAVE for effective inbox management. How long do I have to wait for this? I’m still waiting for rules-based filtering. 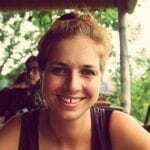 I’m still sticking with mailbird, but every now and then I get annoyed enough to go looking over the competition for an alternative because this essential feature is missing – I hope mailbird comes up with it before I find another option, because I do genuinely like most of what it offers, and I don’t really want to go through the migration process. I keep trying to use mailbird as well but the filtering is a big issue. My server backend uses zimbra. Zimbra has server-side filtering system which means I use the web client to access the underlying ZImbra features and only use mailbird for basic email functionality. It’s really a shame but it looks like the trade-off we have for email clients are either bare-bones commercial in which we pay for lack of features or feature full open source clients that aren’t supported any better than the commercial products.